For this one, I started out with something completely different, in mind. Then, I was inspired by a color combo I saw on Pintrest, my latest creative obsession. Love that site!! I paired up bits from three stamp sets for this little guy and even did a little "fussy cutting" which is something I generally hide from. Lol! 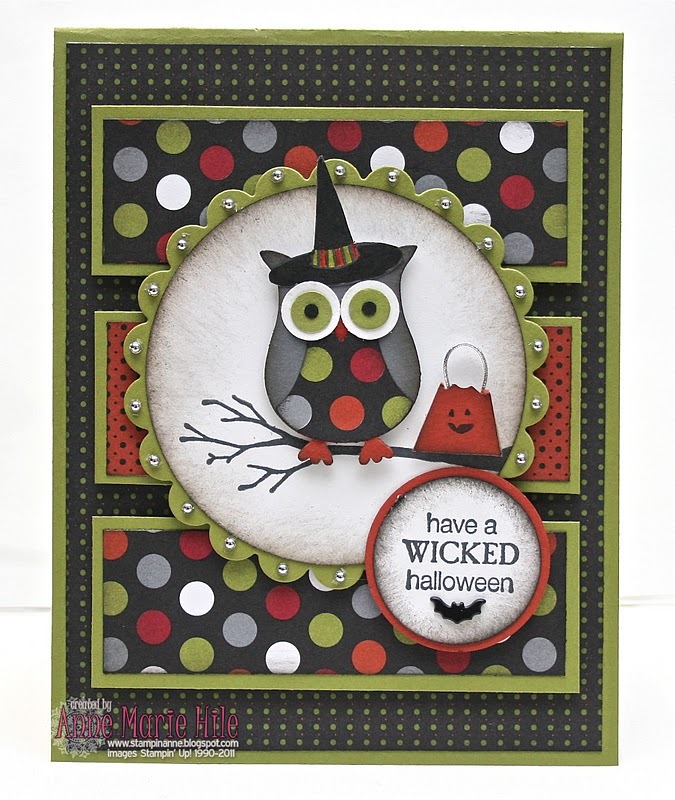 The witch hat from the Wicked Cool stamp set fits perfectly on the punched owl. I'm sure I'm not the first to try this out, but I was pretty excited when I discovered it. Although I didn't actually USE the trick-or-treating owl from the Warmest of Wishes (hostess) set, I used his "goodie bag" for my inspiration. I simply used a marker to ink up the jack-o'- lantern face on the stamp and hand-cut a little treat bag. I added a piece of silver elastic cord for the handle. Although, as I type this, I kind of wonder how this hooter is going to haul his "loot" as he doesn't have hands or wings...hmmmm...maybe he will carry it in his beak? GAH...Why am I even thinking about that? Haha! I sponged around the image, the owl and the sentiment with some Basic Black Classic ink for an eerie-vibe. Every layer is popped up, too. It's hard to see in photos but it is actually a fairly bulky card. Enjoy your day today! :) If I haven't stopped by to visit you recently, please know that I'm trying. The past few weeks have been absolutely crazy for me. I'm struggling to keep up and adjust to a new schedule. WOW...you sure know how to "bring it" AM! Love the details on your Owl...he is adorable and love the papers and mixture of stamps...outstanding creation my friend! Hope work and life start to flow nicely soon...I think I am in the same boat as you! Wonderful card, Anne Marie. I like the colors and DP. The paper pieced owl looks super cute-love it ! Anne Marie this is absolutely gorgeous and brilliant at the same time!!! Love your cute owl! Love the combination of dsp you've used too. We don't have any halloween sets unfortunately or I'd definitely be casing it. It's too-hoo cute! This is absolutely adorable! Love all the wonderful details and how you mixed up several stamp sets to create this cutie! Awesome layout and color combination! Love it!! Love how you used different stamp sets and the colours/paper are fab!! Adorable!!! Love how you used all the different stamp sets too. So very cute with all that pretty patterned paper. Ahhh, he IS a cutie-patootie! Love all the little extras, especially his treat bag! Anne Marie, this is fabulous! I love the owl and all his goodies. 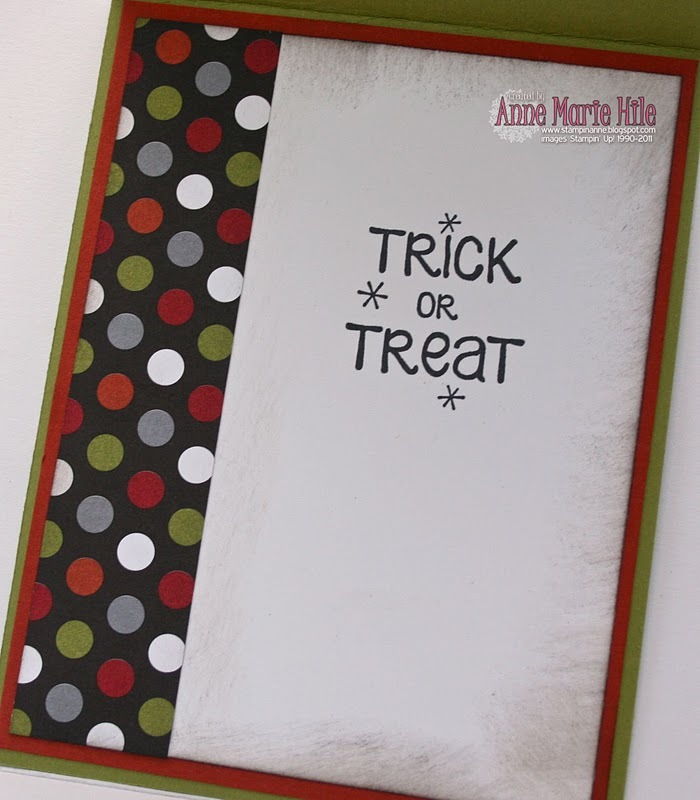 Your use of the DSP will all the dimension is amazing - a stunning/fun card. OK... I am officially in LOVE with this card. Love. it. Yes sirreeeee... I am in LOVE with it. Love the silly bird, the fabulous bag, the inking on the focal elements, the dsp, even the pearls... and who would have put pearls on a halloween card.... only you could have made it look just so right to use pearls. My favorite card this week. Love it!! I did send you my address, right? LOL I am so putting that hat on the next owl that I punch out; too darn cute! I knew I should have bought Out on a Limb! You definitely rocked your own sketch! I want to go hide my poor card now. 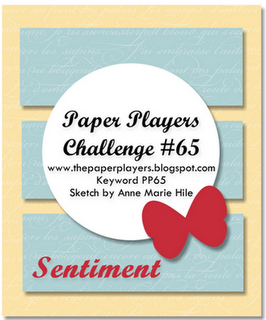 Anne Marie, love how you pulled all of these images together to create such a cute little scene! Of course, I'm lovin' all the layers and colors. What a fun card! Love it!! This is so cute! Great stamp sets to pair up for a project. This is so STINKIN CUTE! I might have to CASE it. Very, very cute and great sketch!!! love the colors and the layers with that witch and I mean that in a loving way :) Wonderful card. So Cute! I love the little bag you made, sometimes I forget to freehand items! Thanks for the reminder! Love this card, you did a fabulous job on your sketch! I love your card too. What great paper and the owl is too cute! Can you say adorable? Oh, I can and this is definitely adorable! 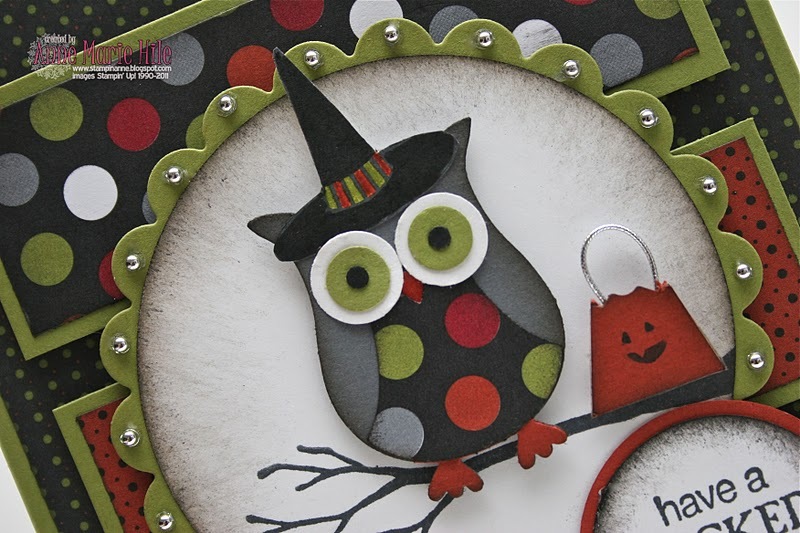 Love all the embellies you added to this cute hoot-de-whoo! Terrific Halloween card! Love the owl! How did you ever think of all those pieces in the different stamp sets and put it all together?! Brilliant!! Oh - he's just perfect!! Love that you paper pieced his body with the polkadots!!! Those gems around the scallop are perfect!! I love his big green eyes too!! Way to use three sets!! I'd love to play along, but I'm not sure I can make the entry deadline due to my craft fair posts, but we'll see!!! I just love your card! This little owl is so cute. I love the layout with the different dsp. The witch hat is just perfect for the halloween owl. I bet he'll find a way to carry his little bag of goodies. 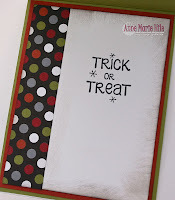 Anne Marie This Card is one of my favorite Halloween Cards Hands Down. You are the Halloween Queen! Anne Marie - your cards are sensational. I'm so glad to have stumbled onto your blog. What incredible artwork! Your card brought a big smile to my face. Your owl is fantastic all dressed up with a witch hat! I might have to give this one a try. Love the owl and his hat! This is such a beautifully done card, and the layers are very rich. I love this. Over the top fabulous, A-M! There are so many details...and I LOVE the layers! Great card! Oh my goodness, this little owl is the cutest I have ever seen!!! Way to rock the challenge, miss hostess! Love the witch hat and the treat bag--how clever you are! Really love the black sponging and the uber erie vibe it gives. 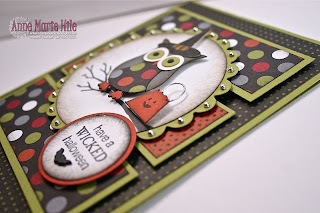 Awesome card AM and I saw it made it to Nancy Riley's iPicks...you ROCK! This is such a great sketch and WOW! Love all of the layers on that card!! Your witchy owl is too cute! What an awsome Halloween Card!! I just love the little owl and his hat. Tooo cute!